Louder, higher, and of course…. faster! From the very beginning, this is the motto that made humankind advance. This is also what makes the automakers’ world go round. However, there are people out there chasing achievements that very few would dare to try and that mean much more than a speed record. By car, you can travel in many different ways: on all four wheels and respecting the rules and road signs, which is highly recommended, but also in some other ways that are only suitable for real experts, such as skidding, reverse driving, on two wheels, in unconventional vehicles, with no fuel or underwater… Below you can find the 7 most original and unconventional ways to travel by car. Don’t try it at home! Undoubtedly, this is the most original way to drive, but it still needs a little more time to become more than a mere concept car. At the Geneva Motor Show 2008, the sQuaba was presented, the first fully submersible car that can reach up to 10 meters depth. Although it sounds crazy, in countries like the United States, races involving these vehicles are more common than we think. Recently, Honda broke its own speed record for reaching 187.6 km/h with its Mean Mower model. Just thinking about it makes your neck ache! Well, the fastest reverse driving car in the world is the Nissan LEAF. On the steering wheel, the famous driver Terry Grant, who is an expert in making weird things with cars and breaking this kind of records. He reverse drove a mile (1.6 kilometers) without mirrors or cameras in just over 1 minute and 11 seconds. And the circuit was full of curves and obstacles! Skidding, and it can be done at full speed or traveling as far as possible. Last year, the Polish driver Kuba Przygonsky was able to skid with his Toyota GT 86 at a speed of more than 217.9 km/h. Meanwhile, Johan Schwartz has succeeded in drifting more than 82 km with is BMW M5. What do you think it’s more impressive? From one coast of the United States to the other one in only 28 hours and 50 minutes. The 2,813.7-mile drive between Manhattan and Redondo Beach in California with only three refueling stops. In order to achieve this, Ed Bolian had to drive his Mercedes CL55 AMG at an average speed of 98 miles/h and pimped it up with extra fuel tanks. We’ve seen it in movies and in some sporting events – incredible cars driving on the wheels of one side. Driving like this for a couple of meters already seems pretty difficult, right? 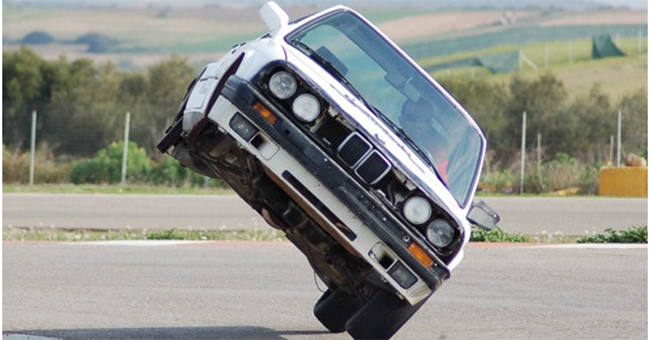 However, the incredible Italian driver Michele Pilla was able to drive his BMW 316 on two wheels… for 371 kilometers! Car Puccino, this is the clever name of the Volkswagen Scirocco that makes its engine work with about 1,160 expresso coffees every 100 km. It has already traveled the 337 kilometers between Manchester and London, reaching a speed of 100 km/h. Extra bonus: Although these amazing records are especially original, the main obsession of automakers has always been speed. And this title is hold by… a Swedish car! Last May, Koenigsegg ONE, a Swedish racing car with 1.160cv, exceeded a speed of 440km/h to become the fastest car in history. Louder, higher, and of course.... faster! From the very beginning, this is the motto that made humankind advance. This is also what makes the automakers' world go round.